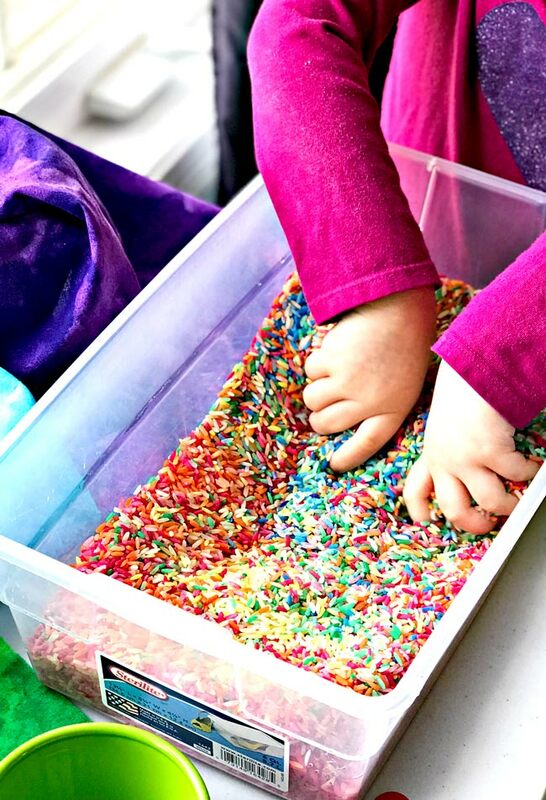 A few weeks ago, I wrote about sensory play ideas for preschoolers. I provided a rundown of activities we do at home. 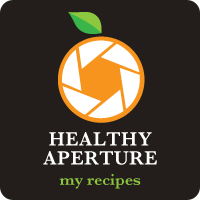 But then I realized, it might be more convenient for you if I broke those activities down into individual blog posts with more specific recipes. So here we are! 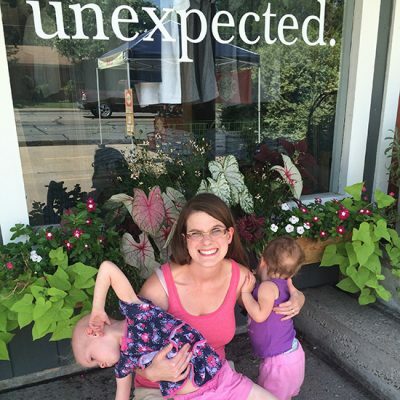 Today’s blog post focuses on our family’s beloved rainbow rice recipe. It is modified from Asia Citro’s priceless book, 150+ Screen-Free Activities for Kids. For this recipe to work, it had to meet a few criteria. First, it had to be easy to make. Just one baggie and two ingredients is easy to me. Next, it had to be gluten-free. So, I use gluten-free rice I purchased in bulk at Costco. Then it needed to be easy on the skin. I chose Color Splash liquid watercolors from Amazon, and the next time I make a purchase, I’m going bulk sizing on that, too! Then it needed to store well. 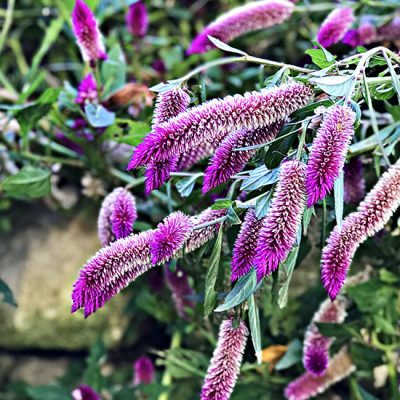 I love this stuff, and it isn’t hard to make. But I don’t want to have to make it all the time. Finally, it had to be pretty. We’re a visually stimulated family, and color matters, so I went with basic colors in a rainbow fashion. Spiriteds, if you frequently find yourself peeling restless kiddos off ceilings and your energy bank is telling you it is wine-thirty somewhere, then I cannot highly suggest this book enough. We comb through it for inspiration on the regular. Both Toodle and Twinkle find the activities intellectually stimulating in spite of being 3.5 years apart in age. And this rainbow rice recipe? Well, it’s a keeper. 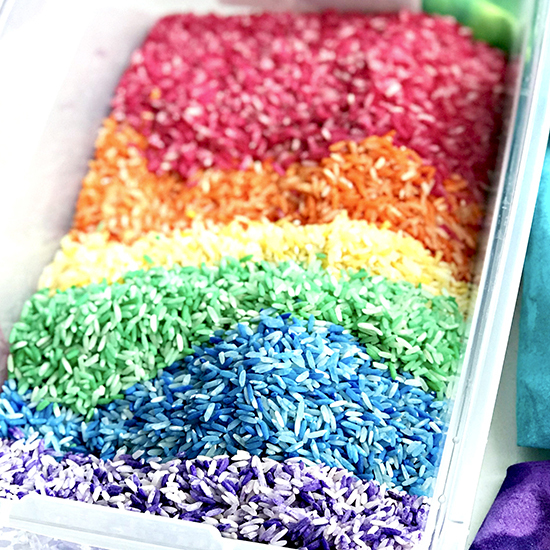 But you might wonder, what can you do with rainbow rice? 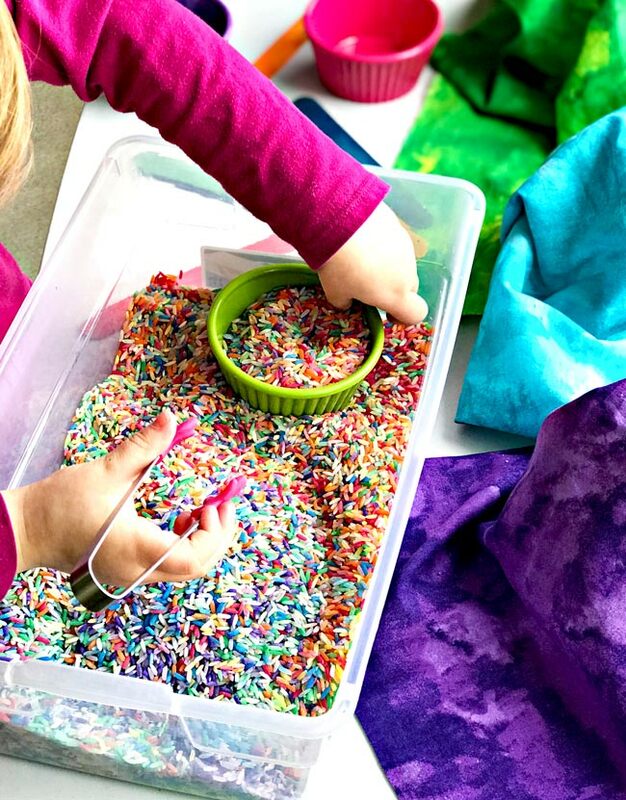 I wondered the same thing when I first learned about sensory play. The concept of dyeing rice for play seemed as difficult to me as learning to cook with coconut oil. 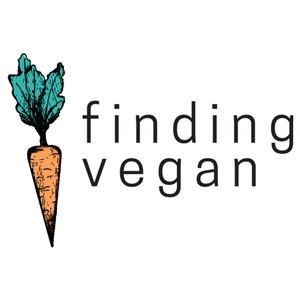 I legit had to Google “how to cook with coconut oil” when we first went paleo, and I still didn’t understand it. But, wait, Google, is coconut oil a liquid or a solid? Is it butter or lard? WHAT AM I EVEN DOING WITH IT? It makes kale taste good, you say? THEN I’M SOLD!!!!!! Sorry, kale, but you were an acquired taste. 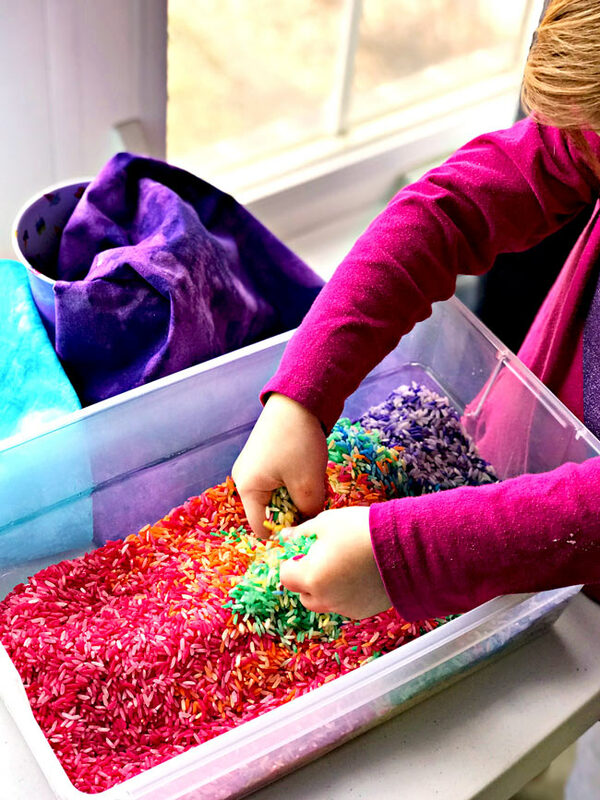 However, this rainbow rice recipe is super easy to prepare, and the sensory play possibilities are endless. 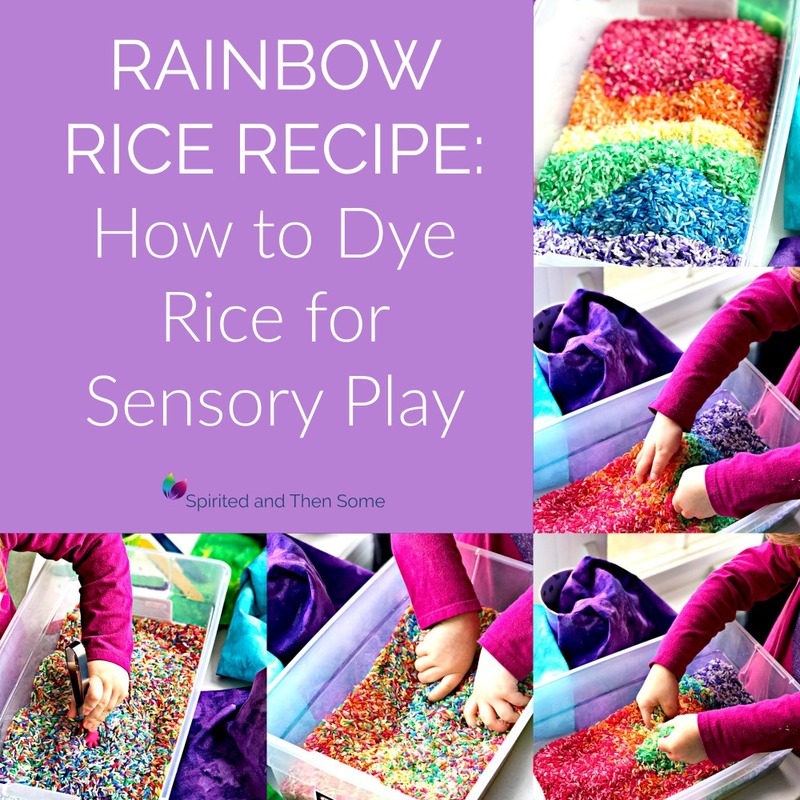 Even the process of making rainbow rice is sensory play-related. 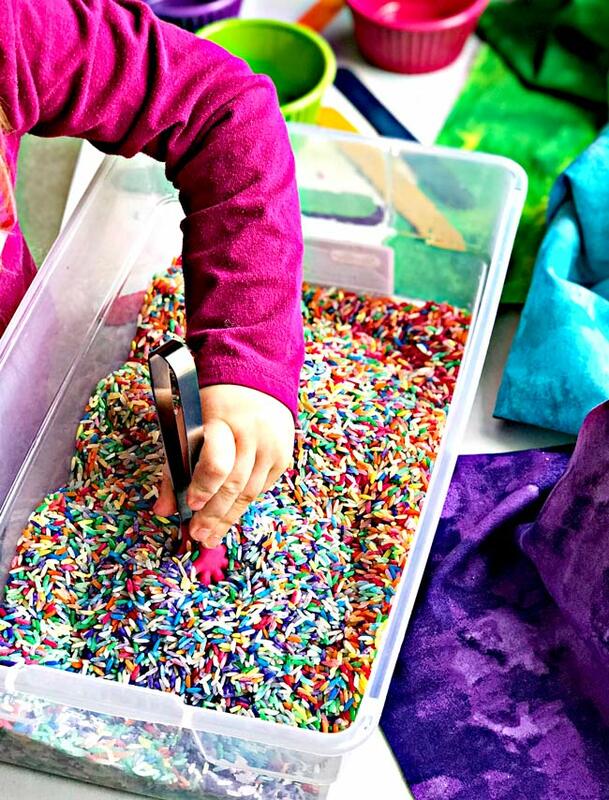 There’s nothing like kneading rice and watercolors in a baggie to get those hand and finger muscles working! Hence, I encourage the girls to help me make our rainbow rice batches. However, admittedly, if everyone is a little bit on the ceiling that day, I just make the batches myself and let them go to town. Spiriteds, I am not a doctor, nurse, or occupational therapist, nor do I play any of those on TV. So, I’m no expert. 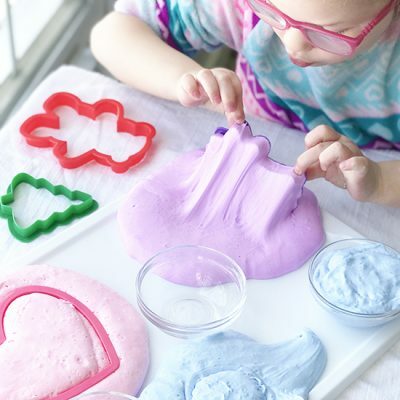 But what knowledge I have uncovered about fine motor skills and child development leads me to believe more is going on here than just playing with food. We strive to help the girls build their hand-eye coordination and fine motor skills/hand-finger strength. Although they play with utensils, we encourage them to play with their bare hands and to cup the rice (as though getting water by hand from a faucet). 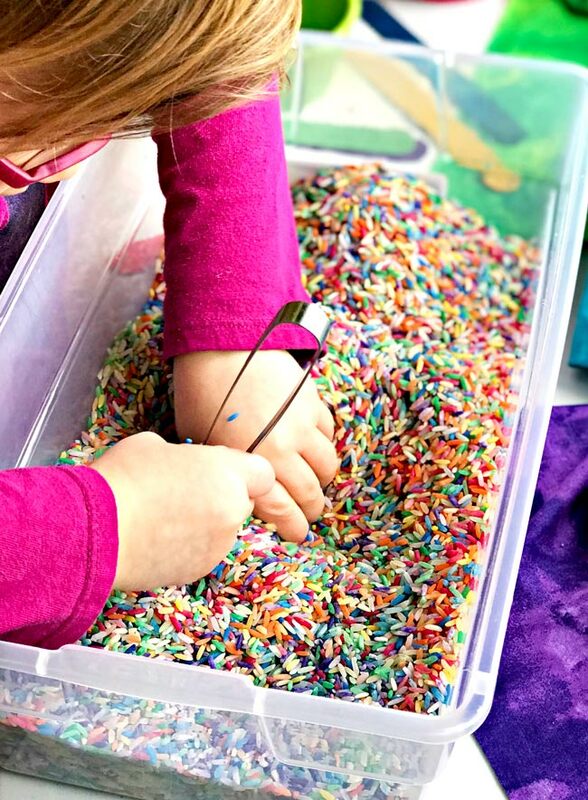 According to the book 101 Games and Activities for Children with Autism, Asperger’s, and Sensory Processing Disorder by Tara Delaney, the ability to bend fingers and cup one’s hands is an important fine motor skill. But play is play, so while we encourage freehand play, we also just say play, girls, and enjoy! 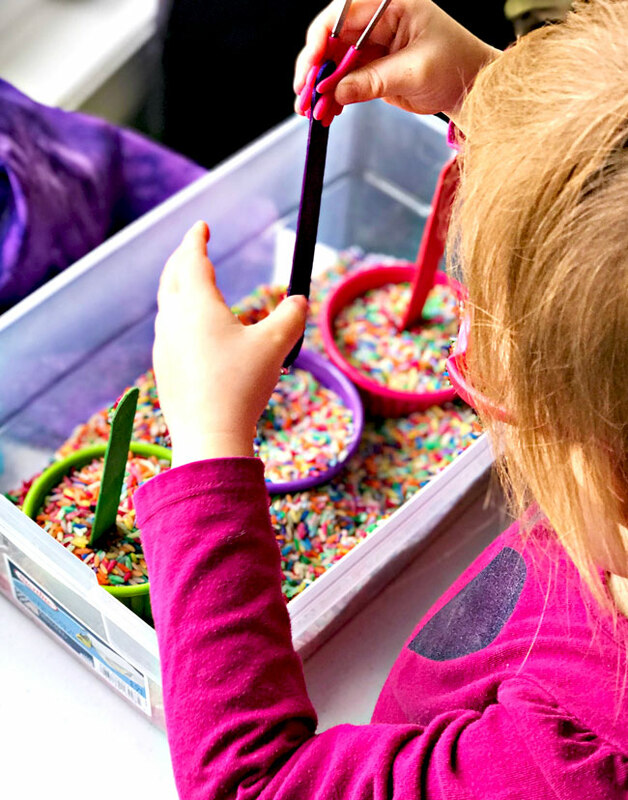 Rainbow rice bins are not only pretty but also encourage what seems like limitless growth opportunities, and the girls stay enthralled for hours. Seriously. Hours. Like, I don’t have to peel anyone off the ceiling (and I include myself in this equation, K-Hubs, too). Everyone just kind of relaxes, and who doesn’t like to relax with pretty rice colors from time to time? Honestly, this rainbow rice recipe is our happy place. When it comes to making a rainbow rice recipe, I like to have more on hand than I think I’ll need. This makes it easier to portion out between the girls as well as for different types of activities. 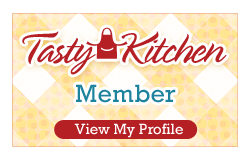 And it saves me from having to make batches on the fly. 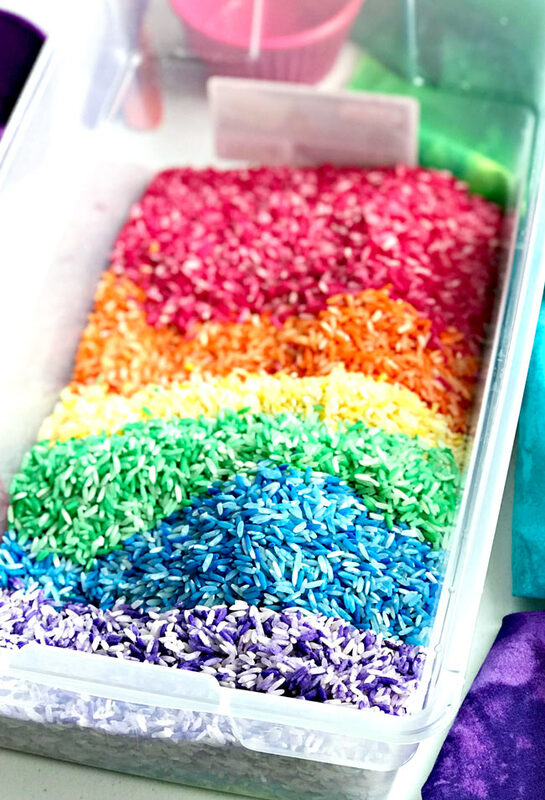 Thus, this rainbow rice recipe is for four cups per color. I typically work with six colors, for a total of 24 cups of dyed rice. And, Spiriteds, we go through this stuff like Blanche Devereaux went through men on Golden Girls. But if it keeps our feet reasonably planted somewhere on or near the ground, I call it a WIN. 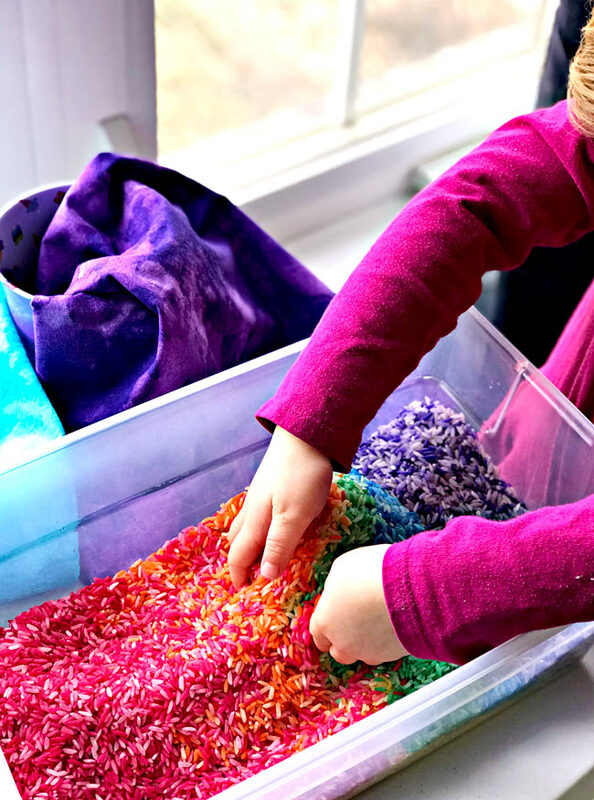 Combine rice and liquid watercolors in a large baggie, then remove all the air, seal the baggie, and knead the ingredients together. Add more drops of liquid watercolors, if needed. Spread rice out onto a cookie sheet or baking pan and let dry overnight. Or, leave in the baggie and place outside (with the baggie open) and let it air dry for about 30 minutes to two hours, depending on weather conditions.